A couple of spoilers are below. 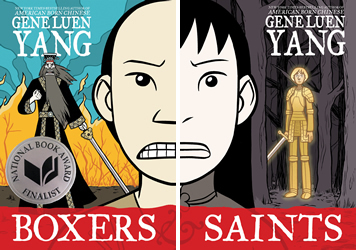 Saints is the second book in the two book graphic series, Boxer & Saints, by Gene Luen Yang. While it is shorter than Boxers, it still packs a lot of story. However, I would have liked to have seen more of back story of Four-Girl (or Vibiana as she will become known). We see how she is the unwanted fourth-girl of her family and how she defies the odds by living and having to deal with a strict, old-school Chinese family ruled by her Grandfather. We even see how her story connects with Boa’s in Boxers. Yet, there is still more “tell” than “show” within this. And there seemed to be less historical context this time. Here we see more of the present and less of the culture, mythology and history of the country. It would have worked if we saw the why the Christians are so hated by the Chinese and therefore, why the Boxer Rebellion was so powerful. Little things could have tied this story up more nicely. Vibiana, the name Four-Girl takes when she converts to Christianity, is having parallel stories to the first book. Things like, she needed a mentor like Boa had or having her remember the scene that ties her and Boa together. This book has build-up but then fizzles out and does not have the same punch as the first story. However, the tie-in to Vibiana’s story and Joan of Arc is a good touch. While obvious in parts (if you know Joan of Arcs history, you have a pretty good idea Vibiana’s fate) it might have been stronger. Vibiana’s and Joan of Arc’s faiths are rooted differently even if both are “Warrior Maidens.” Also, while you can see and understand some of the hatred for the Christians, at the same time, they are almost sympathetic. The why of this was a question I had throughout Vibiana’s tale. The art, like the last time, is signature Yang. And while I like this series, and Saints, it did make me wonder about possible style changes and how that would have changed the story overall. Therefore, this is a great book to teach in high school or even college, and still will have an eager audience with a high 7th graders. But please read Boxers first.